The average cost of retirement, based on the typical time spent in retirement and average household spending for retirees, is $828,000. That works out to around $46,000 per year, assuming that your retirement lasts 18 years. 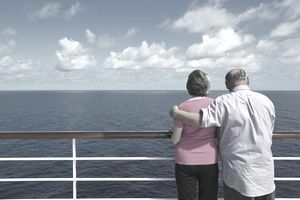 Pinning down the exact cost of a cruise ship retirement can be difficult. The average cruise ship passenger spends around $213 per day, which would add up to $77,745 for someone living aboard the ship full-time. But that's the average spend; it doesn't take into account cheaper fares, which could drive the per-day cost of cruising down significantly, or luxury fares which could push the final cost higher. There are some cruise lines that allow passengers to book a cabin permanently and enjoy a discount when paying annually or biannually. If you're able to find cruise line bargains, it could be less expensive to retire on a cruise ship compared to an assisted living facility. According to Genworth Financial, an individual stay at an assisted living facility cost $48,000 on average in 2018. And if living on a cruise ship helps you stay healthy, you could avoid the costs of long-term care, which could easily surpass $100,000 per year if you don't have long-term care insurance. Those things might all be important to you, or you might value some of them more than others. Something else to think about: most cruise lines don't allow you to bring pets onboard.